Gels tend to slip and bunch of worn without socks. For best results, please wear with snug fitting socks and shoes. Eliminate Pressure Points: Each step you take concentrates your entire weight on a few pressure points on the bottom of your foot. Our gels help spread that pressure out and ease your pain. Reduces impact to the ball of the foot by distributing pressure across the foot. The Gel cushion pads have been designed to fit under your forefoot, helping to reducing the burning sensation under your metatarsal heads when walking/running. 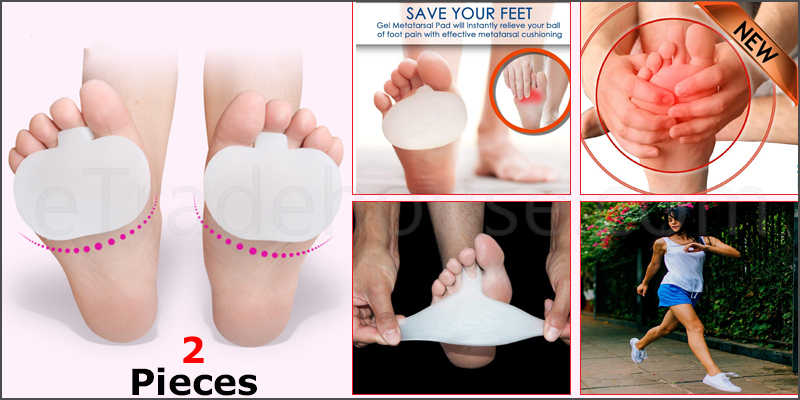 Instant Relief Foot Pain: Our metatarsal pads help in foot problem like itching, burning, blisters, or cracks on balls of your feet. Efficient to relieve foot pain and discomfort, Atrophy, metatarsalgia pain and mortons neuroma. Super Cushioning: Non-slip gel metatarsal pads provide superior cushioning for the forefoot. Gel Absorbs Shock and vibrations. The loop is stretchy which easily fits over your 2nd toe helping to position the pad under the metatarsal bone joints.